Hash oil (also called honey oil, BHO and dabs) has exploded on the North American scene. The past few years have seen a proliferation of marijuana products going far beyond traditional hashish. Long before kids were blowing up suburban garages with compressed butane and before ingesting cannabis had anything to do with a blow torch, excellent quality hash existed in a handful of special places. Let's explore some of this heritage and consider what it means for marijuana connoisseurs in 2014. First of all - what is hash anyway, and what about hash oil? As a more compressed/concentrated form of marijuana, hash (hashish) became popular during global prohibition of cannabis because of its relative ease of transport. This is similar to the gain in popularity of distilled spirits over wine and beer during American alcohol prohibition. In the USA, hash shows up sporadically and becomes the stuff of urban legend. But hash has never been popular or widely available in the United States. Why has the European tradition of hash smoking failed to catch on in the US? Locals in Amsterdam smoke hash rolled with tobacco. Maybe smoking 'bud' is an American thing. Perhaps it traces back to the influx of cheap Mexican weed in the 70s, followed by the flood of BC Bud, outdoor weed from the emerald triangle in California and finally recreational legalization in Colorado and Washington State. Maybe it had to do with the proximity to Jamacia and hypnotic Rastafarian grooves. Or maybe it is because Americans can drive a car load of stinky marijuana from California to NY without interaction if they obey traffic laws, while drivers in Europe had lots of borders to cross. Hash is purified marijuana, produced by isolating the psychoactive active-ingredient-rich trichomes (resin glands) from the plant material. Examining a marijuana flower closely will show small, glassy, clear to amber colored trichomes that look like little pins, with heads on stalks. These trichomes can be removed mechanically (as with charas or ice hash) or by using solvents like butane or CO2. The resulting isolated trichomes are pressed together to make hash. Hand rubbed charas are a well known classic form of hash from Nepal and India, made from the resin collected from hands during the hand-processing of marijuana. Gardaa is an excent hashish produced in the northern parts of Afghanistan and Pakistan. Its format varies slightly by region, with some formats being powdery and others being a dark, pliable solid. Domestically, screens in various formats can be used to separate the trichomes from plant material well enough to produce very pure hash. Fine powder (kief) is created by screening the cannabis over screens that are 127 - 135 lines/inch. The resin glands that fall off of marijuana flowers can be obtained at home from stash-boxes with screened bottoms. Quality product is made slowly with light pressure, taking care not to screen undesirable plant material into the kief. Instructions for preparing hash are available online. 'Ice hash' uses the same principle, with bags made out of silk-screen material, ice and water. Cold water extraction makes the trichomes fragile and more likely to fall off the plant material, filter through the various layers of silk screen bag until they are isolated and collected. One benefit of this method is that no harmful solvents are used. Supplies can be obtained for under $200 USD from Fresh Headies in BC. Commercial tumblers using screens in drum formats are ideal for larger operations, with excellent examples of both tumblers and ice systems. Screens can be purchased at printing stores for under thirty dollars. The resulting powder can be further pressed into solid shapes using heat and pressure. The resulting powdery screened product will vary in quality vastly, depending on raw material quality and processing factors like time and pressure. It is variously called pollen (polm), kief (kif), skuff, scuff, (scuff is technically the material used to make the hash and the verb of obtaining it), The resulting product is available as-is at dispensaries and hash markets where marijuana is legal. The concept behind hash oil is to separate the desired psychoactive compounds (ideally along with aroma and flavor compounds) while leaving the other material behind. The process is creating a marijuana 'essential oil' (not to be confused with the hemp oil which is extracted from seeds). The main psychoactive compounds in marijuana are not water soluble - but they are soluble in fats, alcohols and other solvents like butane and CO2 . 'Dabs' refers to concentrate products (hash or honey oil) and the process of smoking such products in specialized vaporizers. Think of dabs as the next generation of hashish, a cannabis extract popular for centuries. This hash oil is a waxy version of hash made by refining a marijuana extract so only crystallized resins (and no structural plant materials) are left behind. Hash oil can be made from a wide range of solvents. High quality hash oil is sometimes called honey oil. 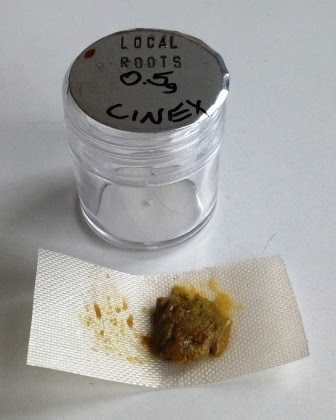 Other textures of hash oil are know as shatter, wax, ear wax and diffent local terms. Probably the most popular hash oil available today is BHO - Butane Hash Oil - made using solvents of varying purity (usually sold as lighter fluid, widely available at gas stations, etc). Some claim up to 1% of the butane used can remain in the hash oil (this seems unlikely to the author). This residual butane has health risks of its own. Despite efforts to 'purge' the hash oil, the product may remain contaminated by non-volatile contaminants other than butane. Brands like Ronson state on their MSDS sheets that they contain 99% butane. This means they contain 1% something else, which may be a simple mix of hydrocarbons that will blow off, or it could be something else that will remain and contaminate the hash oil. (Have you ever had a 'plasticy' taste?). Smoking systems that involve heating a metal or ceramic nail introduce the very real possibility of introducing metal toxins. Blow torches are inherently dangerous when used by the intoxicated. One undesirable consequence of over-processing marijuana is the potential to strip out desirable aroma & flavor compounds. After all, a 100% THC extract wouldn't have the fruity and complex aromatic bouquet of a well cured cannabis flower. O Pen Vape- An E-Cigarette for Weed! Often, hash oil extracts are smoked in elaborate devices, some requiring the use of a blowtorch and a 'nail'. The blowtorch isused to super-heat the metal or ceramic element on the 'nail', and then the hash oil extract is smeared on the heated 'nail' and the resulting vapor is inhaled through a mouth piece. Water cooling/filtration may or may not be involved. CO2 extraction has great promise. This technique uses sophisticated extractors (not yet available for practical home usage) which use pressurized CO2 to extract the essential oil from the cannabis flowers. Work with processing regimens will continue to improve the product. Highly pure honey oil has very little odor and can easily be enjoyed in devices that look like e-cigarettes and spare the lungs the harsh hit of burning smoke. The O-Pen Vape unit looks like a conventional e-cigarette, and costs less that $40 including the charger. Refill cartridges are available for $30. Similar discreet and effective systems are likely to become a commercial format of choice, due to the relative ease of calibrating dosage and standardizing potency of the product. If a smoker is going to be using the product as a 'topper' for marijuana smoked in a pipe or bong, ground hash or kief is recommended. Loose kief or pollen is best enjoyed mixed with another smoking base - ground cannabis flower or tobacco works well. This can be smoked through a pipe, water pipe or can be rolled in paper. Lighter gold/beige colors indicate higher quality than greenish powder (green indicates it has been screened long enough to include undesirable leaf material in addition to trichomes). Consumers looking for a natural product should consider domestic kief or hash made by cold water extraction if looking for an ideal cannabis topper. Hash oil in one of its many guises is ideal for those who vaporize their cannabis. Its suitability for use in e-cigarette type devices has great commercial potential. Home vaporizing systems will be discussed in a later article. Hash oil varies in quality and potency, and few offer the results of analytical testing due to the expense of testing. Remember, blow torches are inherently dangerous when operated by the intoxicated. Concerns about purity and lingering solvents make CO2 extracted products preferred over Butane extracted products (BHO), until purity can be guaranteed otherwise. We grow quality organic sativa and indica buds. We sell top quality medical marijuana strains. Strains available now: white widow, purple haze, bubba kush, blue dream, OG Kush, Sour Diesel, Jack herer, Indoor headies, ak47, blue widow, blueberry, bubba kush. Bulk orders accepted. We supply to dispensaries and other individual patients. Are there any websites where I can purchase these goods.